In much less than 10,000 years, the digital revolution has completely changed the world of work. “The machine learning revolution has really kicked in: machines can see better than humans can, diagnose cancer from medical images, understand speech almost as well, and do more and more analytical reasoning,” Erik Brynjolfsson of MIT explained in a session on the future of work. The result? 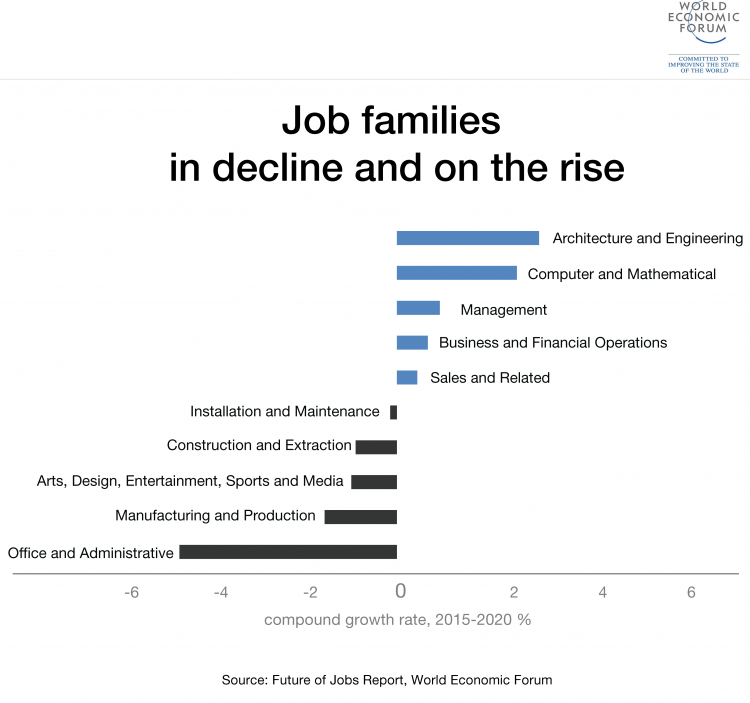 As many as 47% of jobs could be completely wiped out by automation over the next 20 years or so. The average person spends one-third of their adult life at work. What happens when such a fundamental part of who we are changes beyond recognition? The first reaction is fear. That’s what we’ve seen playing out across the developed world this past year, resulting in a series of shock electoral results. “What you have is anxiety about a world that is changing,” Alexander De Croo, Belgian’s deputy prime minister, told participants in a session on the rise of populism, which many see as a reaction to falling incomes and disappearing jobs. The solutions came in thick and fast throughout the meeting. Some of them – people need to learn new skills, C Vijayakumar of HCL Technologies said in one session – we’ve heard many times before. Others were new, at least for Davos: the idea of a universal basic income, for example. “I suspect that 10 years ago we would not have been having this conversation here,” Zanny Minton Beddoes of The Economist said as she introduced a one-on-one session with Guy Standing, a professor who has been making the case for a universal basic income for the past three decades. It might all sound a bit “pie in the sky” but as Philip Jennings of UNI Global Union noted in one session, in today’s environment, “it takes on an amplitude that isn’t just fanciful but that is worthy of consideration”. Guy Standing’s argument for a universal basic income (which he shared on the Forum’s blog back in December) is based on a pretty simple but powerful idea: that no matter who we are – a Wall Street banker or a school janitor – we are all contributing to society, and therefore deserve a fair share of its wealth. The danger, philosopher Michael Sandel argued in a session on the topic, is that others now understand this income as a form of compensation for those whose skills are being rendered obsolete by the digital revolution. “We’d essentially be saying: ‘We’re going to pay you off in exchange for you accepting a world in which your contribution to the common good isn’t really required, and what you do with your time, that’s your business.’ I think that would be corrosive,” he argued. That’s because for most people, work is about so much more than just clocking in and picking up a pay check at the end of the month: our jobs are a fundamental part of our identity. 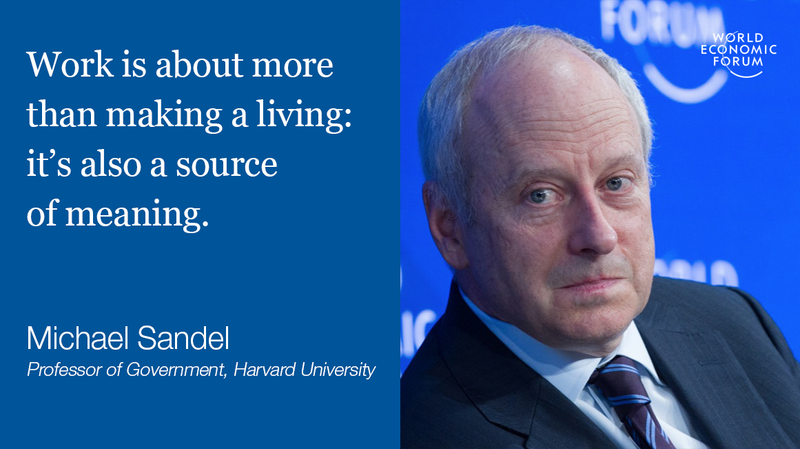 “Work is about more than making a living: it’s also a source of meaning,” Sandel said in another session. You take away that meaning and you end up with an understandably angry, frustrated group of people – rather like what we’re starting to see across the world. But what if as the world of work changed, so too did our understanding of it?